PRICE REDUCED - Even though Seaca is for sale, we look after it as if we will own it for life. Recent upgrades:. Replaced complete bank of house batteries with 8 x 220 amphour US made LIFELINE batteries. - New bimini over cockpit. -. 2 x New GALVANISED gas bottles. Complete main engine service of all filters including replacement with improved water/exhaust mixing elbow. Complete service of generator including replacement of all filters, new impellor, new end cap heat exchanger and new anode. NEW 3.6 metre RIB dinghy and outboard. This is Hull Number 34 of only 36 hand built by Buizen Yachts in Sydney. This SERIES 3 Buizen 48 presents in virtually "as new" condition. The hull was launched in late 2008 and the boat was completed and delivered in 2009. It features the more desirable Teak fit out with cream leather and comes in the Island Stateroom layout. It has all the SERIES 3 upgrades including improved lead keel, teak decks, Arco power winches, ice maker, upgraded hydraulics, etc etc and many extras. 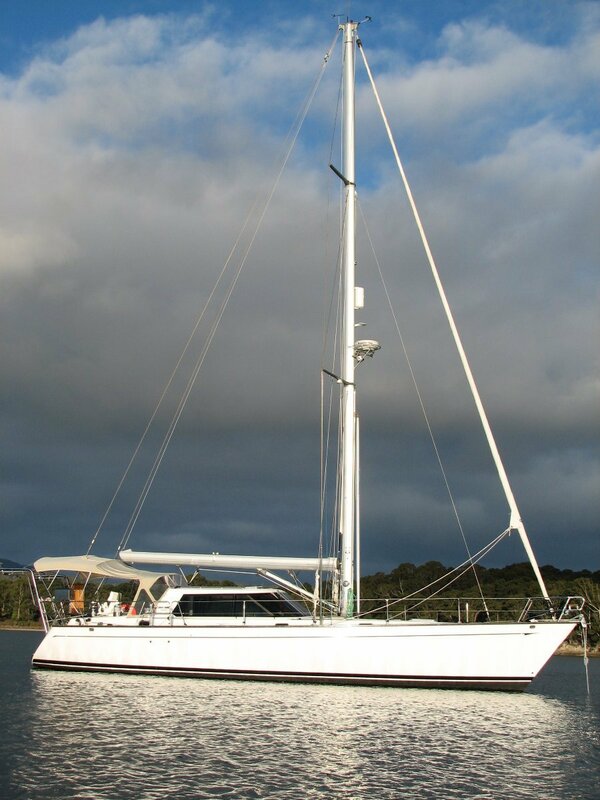 Seaca has been lightly used by an experienced sailing couple in the sheltered waters of the Bruny Channel south of Hobart. (2 of the cabins and the second head have not been used. ) - Seaca offers very good value to a serious purchaser seeking a boat with integrity, style and comfort. Ice Maker as well as independent Freezer and Fridge and ice box in cockpit..
Press Button Hydraulic Winches for easy sail handling and tender retrieval on davits. All cockpit winches are 2 speed hydraulically powered. For a Video of an identical sister ship click on the last photo in the photo gallery or look up Buizen 48 on youtube. Outer skin: Gelcoat tie layered with derakane SPV 1265 vinyl ester resin, backed up with high quality polyester resin and e-glass triaxal reinforcement. All hand laid. Outer skin: Gelcoat tie layered with polyester resin and e-glass reinforcement. All hand laid. Inner skin: polyester resin and e-glass reinforcement. All hand laid. Custom Stainless Steel stemhead with double bow roller, one fitted with a 27.5kg plough anchor and 100 metres of 10mm chain. Stainless steel bow pulpit with teak seat. Stainless steel stern pushpit with seat frames, teak seats and teak back rest. Stainless steel helms seat with teak seat and backrest, hinged off pushpit for access to transom. Stainless steel handrails between pushpit and S/S "A" frame side gates with boarding steps and teak cover to steps. Stainless Steel stanchions with double life lines. 1 @ Blackwater deck pump out. » Teak console and dashboard. Electrical cabinet and switchboard panel and breakers. » Engine controls, warning lights, audible alarm, oil pressure, water temperature gauge, tachometer, voltmeters etc. » Stainless steel engine throttle control with Cockpit/Inside Helm selector. » 240 volt, 24 volt and 12 volt instrumentation board. » Auto pilot Raymarine ST 8002. » Wind instrument direction and speed. » Tridata instrumentation, speed, depth and log. » Moulded fibreglass self draining deck. » Combination wind speed and direction instrumentation. » Hydraulic power pack, pump, valve banks. » Laminated 13mm tinted safety glass windows. » "L" shape main lounge settee leather upholstered. » "Besenzoni"Leather upholstered Helm seat on Stainless pedestal.